Even while immersing myself in the vampiric theories of the wonderful coffins, I have always wished to drive around in the sea. But about being able to drive a sea vessel – I was perfectly sure that it was an impossible thing. I am no merman, and therefore those more imaginative and creative options are left out. The Cabin in the Woods was that movie which took away the last few ideas about being a merman away. Being a half-fish, half-human monster with Piranha-tooth and a blowhole was never the best of things, no matter how well the figure is romanticized and exaggerated with the image of the mermaid from Disney’s cartoonish fortress. The mermaid are still portrayed with their beauty and cuteness which they might hold onto until the end of the world despite of a few exception, and mermans – right from the Mer-Man of He-Man and the Masters of the Universe, there has been not much hope about it, even as Poseidon might wish to have a word or two about it. I would rather read Matthew Arnold’s poem, The Forsaken Merman. There goes all the sea vessels, and the merman element right out of the picture. Now the question would remain about driving in the sea; an unfulfilled desire. So, what remains is the option to drive in whatever parts of sea which takes a peek into the sands of a beach. Driving through the beaches has been there during most of the Malayalam movies songs of the last century, and there was always something emotional about it, from love to friendship, and the sunset or sunrise was there to provide the background with the sea. I used to wonder how they drive around these areas of sand without the sands holding them down like zombies rising from their graves. The four wheels should have gone down, I would think – what are they doing? Drive-In-Beach was the answer. It was never officially an answer until that moment when the place was first visited. Well, we live in a world of paranoia, and this sense is more part of our life than of the post-modern literature. We live in our fears and refuse to accept the truths, and man and science has combined to destroy nature and call it a huge achievement, there are not much to talk about this anxiety, tension and depression which support paranoia on a large scale. But what a visit made sure about, is that the answer is right and close enough to truth. From those Mathematical equations to the news about space expedition, we are forced to believe – but aren’t these supposed-to-be truths pushed right into our brains? Keeping all these in mind, this was explored by driving to the District 13, where I had to go during that time of extended vacation. This was a remarkable journey indeed in many ways. A road trip from Kannur to my hometown would be the longest route I have ever taken in my life in one stretch without stopping for more than just a tea or two. It was also that test which my own car had never taken before. The largest city in North Malabar region and the sixth largest in Kerala proved to be one of the worthiest destinations, as surrounded by history and geographical beauty. The Land of Looms and Lore was a destination which I should have visited long ago. Did I need inspiration to visit such a good destination? What took me so long is a question which is more rhetorical than anything else. But the fact remains that I was late and I would surely admit that. But being late has its charms; and being early always has so many negative things. This late-Kannur-coming was more positive than any other early visits to the other places. It created more wonderful moments than what was possible if the journey had happened long ago. Among those great moments, one of those places remained more striking, and it was here, at Muzhappilangad. Muzhappilangad Beach is located near enough both to Kannur and Thalassery. The path to the beach might be a little narrow, but still beautiful enough, and the beach is long and wide, with not much of disturbance around in the morning when we went there. Thalassery should be the nearest railway station and Calicut the nearest airport. 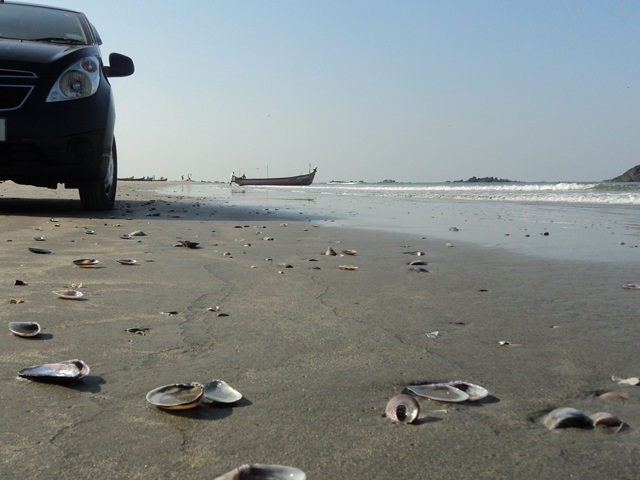 Well, it is the only beach in Kerala where you can drive and splash the sea water around. It is the place where your car becomes a sea vessel of the land. It is the right place for you to take photos of your autmobile with sea, beach and the boats around you giving the feeling that your car or motor-bike is one of those machines which can travel both in water and land, making both the tortoise and the frog jealous. The rocks add to the beauty of the world around. You can just drive and drive until the world gets tiresome. There is also supposed to be an island, Dharmadam island – but that was surely not in the list. With Thalassery is seven kilometres away and Kannur distant by just thirteen kilometres, one has to try hard not to visit this place if they wander around the district or the nearby ones. If you love driving and the beaches, here the right paradise for you. There are no devilish snakes to take you out of this Eden. This place still remains unknown to a good number of people in the South of Kerala, and that remains a mystery. There is so much of peace and calm around this place, which might be quite unusual for a beach, and I would be surprised about the same sitting at any other beach in the South. Another major surprise comes in the form of the superior cleanliness which is seen around the sands. The calmness joins with the cleanliness to create a new world of serenity and a highly camera-loving area around there. Why haven’t most of us been aware about such a place which is better than most of the other beaches is India? This is a question which would have no answer just as the doubts about the low popularity level of the places like Urulanthanni, Paniyeli-Poru and Ilaveezhapoonchira; the last two still experiencing some rise, and with some better roads, they can see more visitors. But our beach still has a better accessibility, and I would be surprised if more people won’t come to know about this beautiful sands of time. As I say about Kannur itself, what strikes the most might still be the blending of history to the nature, this time with the sands of many beaches – resembling our own Prince of Persia’s sands of time which continues to disappear into that void of worthlessness, that black hole filled with white sands. The Prince of Persia was surely not the one person to understand the importance of time, and the total number will not be limited to a few. The hourglasses will continue the job and the world will continue to have its not-so-Persian princes. One can bid adieu to this beautiful beach which provided great hospitality to our car along with hat ancient sea port, but how long until it fades away? The centuries of history would support the cause of the sea port to live in the minds of people. What about this great host of all four-wheelers and two-wheelers known by the name Muzhappilangad? That might lead to the rise of another story, or more than just one tale of travel. There is more about this beach that one should write about, as it is more experienced than talked about. This entry was posted in India, Kerala and tagged beach, calicut, Cannanore, district 13, drive, drive-in, journey, kannur, kerala toursim, kozhikode, mermaid, merman, north kerala, ocean, road trip, sands, sea, sea port, Thalassery. Bookmark the permalink.